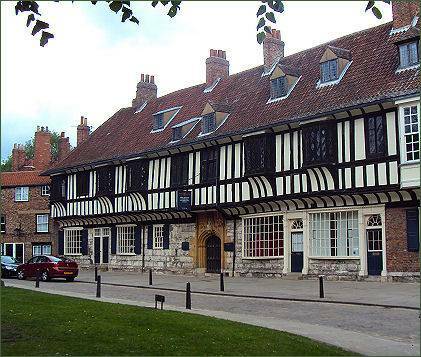 Medieval St William's College, a Grade I listed building, is situated in College Street, to which it bestowed its name and stands in the shadow of York Minster. The black and white timber framed frontage of the building is decorated with several interesting features, including oak carvings, coats of arms, and a sundial. The building's main door has a mouse carving by Robert Thompson, the famous 'Mouse Man of Kilburn'. 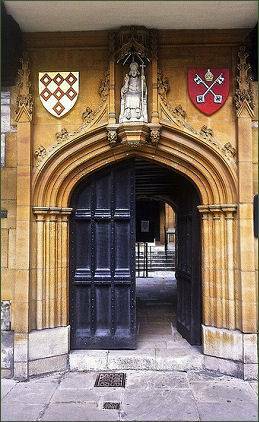 The college was built in 1465 for the Minster's Chantry Priests, who were paid to pray for the souls of the dead. The Lancastrian king, Henry VI granted York Minster a license to establish a college of chantry priests in 1457, however the foundation was delayed by the vicissitudes of the Wars of the Roses, but in 1461 his Yorkist successor, King Edward IV confirmed the grant to the Minster. The building is named in honour of William Fitzherbert, Archbishop of York who died on 8 June 1154, allegedly due to poison administered in the chalice at Mass. 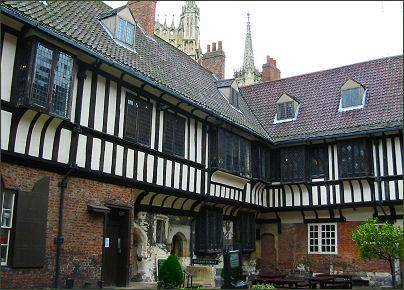 He was York's patron saint who was canonised in 1226. William was chancellor and treasurer of King Henry I. One of FitzHerbert's clerks accused Osbert de Bayeux, an archdeacon of York of the murder, and Osbert was summoned before the king to be tried. Before the trial could take place, however, Stephen died, and the trial never took place. William was buried in York Minster and within a few months of his internment , miracles were attributed to his intervention and a sweet smell came from his tomb when it was damaged during a fire. Most sources state that William's mother was Emma, half-sister of King Stephen and Henry of Blois, Bishop of Winchester, and that she was an illegitimate daughter of Stephen II, Count of Blois, King Stephen's father. New research, however, suggests that Emma might have been a daughter of Hunger fitzOdin, who is mentioned in the Domesday Book as holding lands in Dorset. William was born sometime before the 1090s, but the exact date of birth is unknown. He has the unusual distinction of having been Archbishop of York twice, both before and after his rival Henry Murdac. Over the centuries which followed, the building changed ownership and usage many times, during the Civil War it was used as the Royal Printing Press and has also been used as a private house. At one time it was owned by the Earls of Carlisle, but by the late Victorian period it had fallen into a sorry state of decay. In the late nineteenth century Francis Green, who owned the the nearby Treasurer's House, rescued the building from ruin, purchased it it and subsequently sold it to the City Council at no profit. The council restored the building in around 1902. It then came under the care of the Dean and Chapter of York Minster. There is a restaurant at ground level, and 4 rooms, which are rented out for functions such as banquets and social ceremonies. The largest of the chambers is Maclagan Hall, which was probably the medieval great hall of the chantry priests. 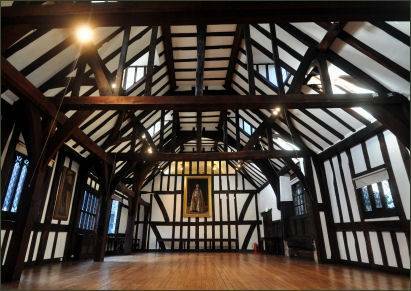 The 'House of Layman', an attractive chamber under the timber roof, which was used as a meeting area by laymen when the Bishops were in convocation. Visitors can tour the medieval chambers at a small cost.